Barring a knockout, winners and losers in boxing are decided by subjective judging. That makes controversy and debate inevitable and corruption easily facilitated. I think boxing fans as a group are far too quick to cry “robbery.” Honest, and capable, observers can easily disagree on how to score a particular round. 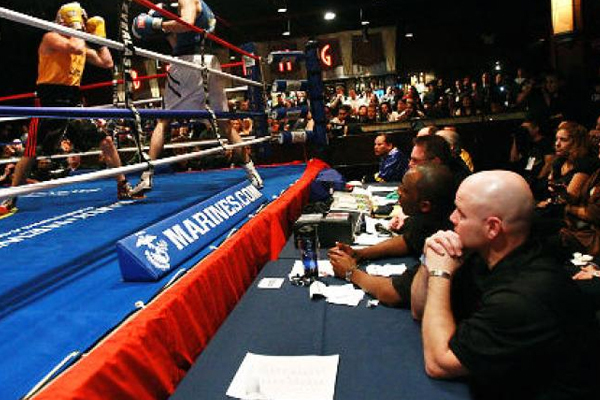 And fights can look radically different based upon where you are sitting–that’s why the three judges sit on different sides of the ring, to make the entire process as fair as possible. Even terrible decisions are most likely the result of incompetence over corruption. And judging a fight is not easy. But there are times when scorecards come in that just defy explanation. More often than not, these out-of-whack cards tend to favor the more popular, or well-connected, fighter. Being a star in boxing has perks–a big-name fighter is far more likely to get the benefit of the doubt with the judges. For one thing, a judge’s ability to see what is going on can often be skewed by what he expects to see. Beyond that, promoters hire judges. Statistically, that has to sway judges toward the promoters’ fighters. People have an amazing ability to form opinions that can benefit them financially in the long term. In recent years, no fighter has been on the winning side of absurd scorecards than Canelo Alvarez. The most infamous case was his fight with Floyd Mayweather in September 2013. Alvarez was still far too inexperienced for Mayweather and was handled with ease. Yet judge C.J. Ross somehow scored the fight a draw. She was laughed out of the sport and hasn’t worked since. But the cards were in general strangely weighted in Canelo’s favor in that fight. Craig Metcalfe gave him three rounds and Dave Moretti four. I would struggle to justify giving Canelo two rounds of that fight, at a maximum. In April 2013, Alvarez defeated Austin Trout, in a fight that was extremely close to any unbiased observer. I scored the fight six rounds each, with Alvarez winning by virtue of his Round 7 knockdown. Judge Stanley Christondoulou gave Alvarez 10 rounds. I have a hard time believing he didn’t fill out his card the night before, in the hotel room. When Alvarez fought Erislandy Lara in July 2014, he won by split decision. I scored the fight the same way Jerry Roth did–seven rounds to five for Lara. Moretti had it seven rounds for Canelo–certainly not out of line in a very close fight. But Levi Martinez scored nine rounds for Alvarez. Alvarez is a charismatic fighter and fights with a pressure style that impresses judges. He usually has the crowd on his side, that can lead judges to mistake near misses for solid punches. Aside from Ross and Christondoulou, none of the scores I have cited here are disgraceful. But it is unquestionable that judges have traditionally favored Alvarez beyond what he truly has seemed to deserve. It’s one more factor to pay attention to when he faces Gennady Golovkin on Saturday night.